Information to start or grow a business and create jobs. Our team of economic development professionals are prepared to assist you throughout the site selection process. We want to help you find the perfect location for your business. All inquiries are kept confidential. Property search options can be used to identify potential buildings and/or sites for your business. Click here for specific property location and mapping functions. If you don’t find the exact site requirements you’re looking for, please give us a call at 252.482.2007 so that we can provide additional assistance! The Edenton Chowan Partnership stands ready to assist you with support and information in making the right location decision. The state has awarded the town of Edenton a $500,000 grant to help a local yacht maker renovate its 38,000-square-foot plant and create 50 new jobs. 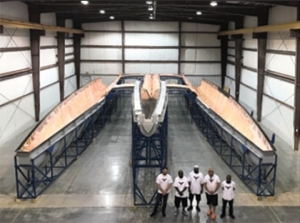 The North Carolina Rural Infrastructure Authority announced Feb. 21 that Edenton will receive the grant through the Building Reuse program to assist Daedalus Composites, a yacht design, engineering and manufacturing company that is also known as Daedalus Yachts, in renovating its existing plant at the town’s airport park at 109 Anchors Way Drive. 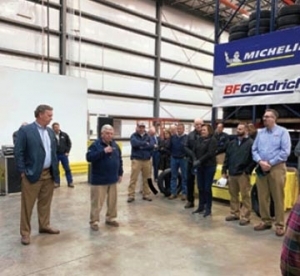 Charlie Creighton (center), CEO of Colony Tire, speaks to the crowd gathered at the grand opening of the new warehouse and corporate office Friday. Scott Creighton (left), president of Colony Tire, waits for his turn to speak. More about the new facilities will appear in a future edition of Chowan Herald. 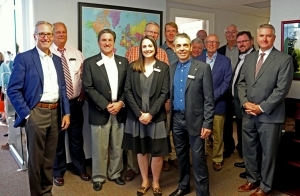 Local officials gathered Tuesday, March 19that Regulator Marine so Mayor Vaughan could present Regulator Marine with a building reuse grant program check for $320,000 from North Carolina Rural Infrastructure Authority. Regulator has invested more than $4 Million and had pledged to use the grant money to create at least 32 new jobs. Instead, as was celebrated at the check presentation, Regulator created twice as many jobs for a total of 64 new jobs and now employees 234 craftsmen building top of the class boats sold and used around the country and abroad. Ross Naddei, founder and CEO of MegaPulse Australia joined representatives of Edenton and Chowan County, the NC East Alliance and Sound Bank to announce (October 18, 2018) his decision to locate the company’s North American operations in a business incubator on the 2nd floor of the bank in downtown Edenton. “This is a fantastic partnership – ideal for us – we’re really thrilled to be here,” said Naddei. MegaPulse, a company based in Australia that manufactures a device that enables lead batteries to last longer rather than going to the landfill, wants to expand into the North American market. The quality of life coupled with the business-friendly atmosphere of Chowan County and the Town of Edenton is enabling Regulator Marine, Inc. to plan an expansion of their facility in Edenton. The Edenton Chowan Partnership also played a significant role in enabling Jimbo’s Jumbos, a nationally-known peanut processor, to expand their processing facility in Edenton. The efforts of then chairman Cy Rich and former Executive Director Frank Miglorie illustrated what can be accomplished through the Partnership and its community-wide team approach to growing and attracting employers in Chowan County. 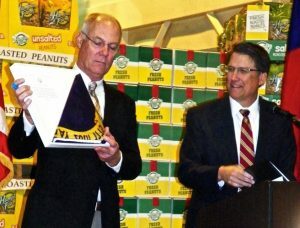 Former Governor Pat McCrory (right) announced the expansion of Jimbo’s Jumbos, a member of the Hampton Farms family, and toured the new plant with manager Hal Burns, seen here making a presentation to the Governor. We can help if you are a business owner interested in relocating or if you have a business already here. Edenton, at the heart of Chowan County, is one of the most beautiful small towns in America according to Forbes.com. As the colonial capital of North Carolina, it is rich in historical assets. Area business leaders know that it is an ideal place to raise their families, develop their businesses, and be part of community that truly knows how to be a good neighbor. An important part of the role of the Partnership is to provide the information that helps build and maintain a strong economic base in our Town and County. So, if you are a business owner, we are here to help you achieve your goal. The Partnership has information resources that can help to meet your needs. The Partnership will be your advocate and a resource for businesses wishing to expand or relocate. The Partnership works closely with government, community organizations and local educators to create an atmosphere in which new and existing business and industry can prosper. If you are looking for land ready to develop, the Partnership has complete information about phase II of Edenton’s Airport Industrial Park. The park is adjacent to the regional airport and a short distance from the Albemarle Sound and barge services. The Partnership functions as a clearinghouse about industrial Sites and Buildings. Look under the Sites and Buildings tab to explore some of the possibilities. When you contact us, the Partnership can help you determine whether the assets available in Edenton and Chowan County will support your needs. North Carolina consistently ranks as one of the top places in the nation to live and do business. The state offers low business costs, supportive business environment, a large and productive labor force, and outstanding scenic and recreational attractions. 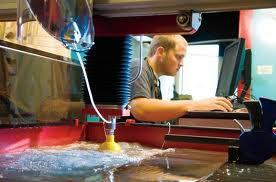 A wide range of resources exist to start, locate, or expand a business in the state. It is important to remember that North Carolina’s corporate income tax rate is 3%, reported by the Tax Foundation to be the lowest in the nation. Electricity rates for industrial, commercial and residential are below the national average. In addition, there are grants and low-interest loans available to business owners along with an extensive array of tax credit incentives to new and expanding industry. Portions of Chowan County are within the newly defined federal Opportunity Zones and thus qualify for additional tax advantages. 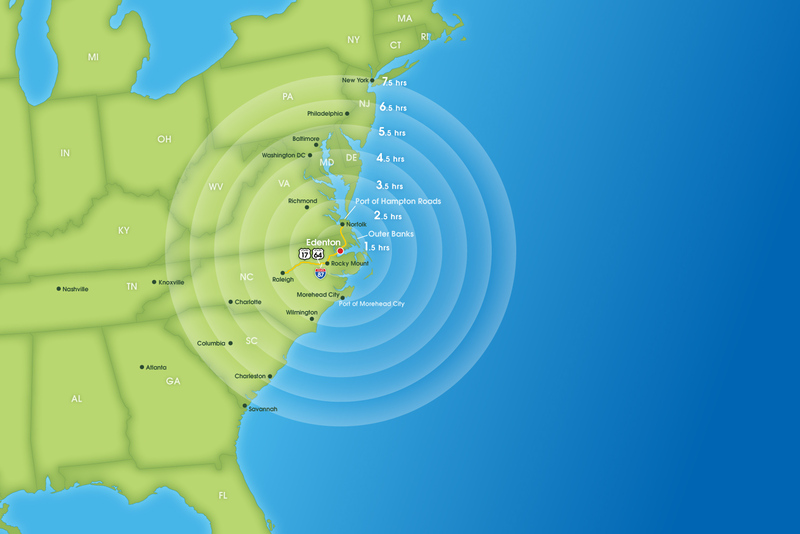 There are four Internet providers in the County: CenturyLink, Mediacom, Intelliport, and Net-Change.com. All four provide high-speed access to support the needs of the business community, as well as residents. Century Link and Mediacom also provide telephone service throughout the county and offer packages that are specifically designed to support business activities. Mediacom, Dish, and Direct TV offer a variety of TV viewing packages. The town and county have ample utility resources to support growing businesses. The town provides electricity to both the town and county and also provides sewer service to those living in the town and in some areas of the county, including the Airport Industrial Park Phase II and Midway Drive acreage. The county provides water to all business and residences in the county. In addition, many of the businesses and resident have access to natural gas. Utility rates run below the national average and reduce the cost of doing business in Chowan County. Special electricity rates are available for certain businesses that are high users and there are special considerations for those companies that provide backup electrical generation during high demand times. The Edenton Chowan Partnership Education Committee acknowledges the fact that a high quality educational system, pre-kindergarten to post-secondary, is vital in building and sustaining a strong, local economy. In order to provide such a system, which meets the needs of every child, leaders at all levels of the education, nonprofit, community, civic, and philanthropic sectors must work together to tackle some of the most pressing challenges. As such, the Partnership’s Education Committee serves as a catalyst for working together, across sectors and along the educational continuum, to produce better educational results in Chowan County. Read more about Workforce Education here. Imagine commuting to work without fighting bumper to bumper traffic. Imagine as a newcomer walking down main street and being greeted by a smile and a cordial hello. Imagine town and county officials who will work with you to obtain a permit or solve another challenge that might affect your business. Imagine a place where people recognize the importance of business to the health and well being of the community. It is hard to believe that this kind of place still exists where you can do business, raise your family, and live among people who eagerly support your success. 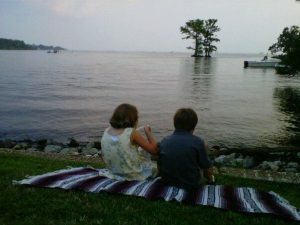 Edenton and Chowan County represent the best of small town America where civility guides the way of life. The Town and County also represent a place that provides an array of outstanding resources that will provide for the needs of your business and your employees. The school system is one of the best in the Northeastern North Carolina. 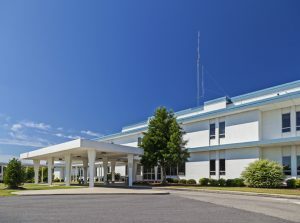 The regional hospital is part of the Vidant system and delivers vital health care services that are unsurpassed in the region. A branch of the College of the Albemarle is located in Edenton and not only serves the needs of traditional and adult learners but also delivers world class work force training to business in need. Imagine living in a waterfront community with outstanding scenic and recreational activities available at your finger tips. You can kayak in Edenton Bay and enjoy the biodiversity along Pembroke Creek. If you like fishing, you can enjoy some of the best sports fishing in the world whether in the County’s fresh water or in the coastal waters along the Outer Banks. Biking, running and golf are also popular activities that folks enjoy year-round in our area. Edenton’s downtown historic district boasts fine dining, coffee shops, and a variety of stores and boutiques for those who are looking for the “rare” find. Life is good in this special region of North Carolina.